You like to shop at Macy’s. But have you ever wondered how to save money at Macy’s? Sure, you know Macy’s has great sales, but you don’t always know when those are going to pop up. So let’s take those Macy’s sales off the table. What I’m talking about is how to save money at Macy’s every day, regardless of whether or not there is a sale going on. The truth is, there are several ways to save money at Macy’s over and above their already competitive prices; you just have to know where to look and how to take advantage of these lesser-known Macy’s discounts. Keep in mind, not all of these money-saving techniques can be paired with Macy’s discount codes, but many of them can. So if you absolutely need to do some shopping at Macy’s and just can’t wait until the next One Day Sale, then you’ll be grateful for these tips. The Macy’s Credit Card comes with plenty of perks, and additional savings just happens to be one of them. All Macy’s Credit Cardholders receive benefits and savings based on the amount you spend with your card each year, in addition to exclusive offers reserved for Macy’s Cardholders multiple times each year. Perhaps my favorite perk of having a Macy’s Credit Card are the “Surprise Savings” that pop up every once in awhile right at the register! However, based on your annual spend, you can earn “Gold” status ($500-1199) or even Platinum ($1200 & up), which include rewards such as free shipping, birthday offers, and even priority customer service, all without an annual fee (see below for more details). Let’s say you REALLY want to extend your Macy’s cardmember benefits; I would encourage you to look into signing up for the Macy’s American Express Credit Card. Not only do all the benefits above apply, but you have the freedom to shop everywhere American Express is welcome, without any annual fee, while still earning Macy’s rewards. In addition to the Macy’s rewards, you also gain access to exclusive Amex offers and special deals exclusively reserved for Macy’s American Express Cardholders. What if I told you that if you answered 5 quick questions about yourself (first name, last name, email, birthday, create password), you could take 25% off your next Macy’s purchase? Well, that’s exactly what will happen when you create a Macy’s profile. That number can vary (typically, I’ve seen them offer 20% off), but last time I checked, Macy’s was offering to email you a code for 25% off just for completing a Macy’s profile. The only caveat: don’t expect to get the code emailed right away; I’ve seen this take a day or two to arrive in an inbox, so plan your shopping accordingly. Macy’s Money is a rewards card you can receive by making qualifying purchases with any form of payment, online and in-store. What I especially love about Macy’s Money is that is can be used in conjunction with coupons & sale prices, even on cosmetics and fragrances! About twice a year, Macy’s will announce when it’s time to earn your Macy’s Money (usually a 5 day period), and then there will be a subsequent 5-6 day period when you can spend your Macy’s Money. Macy’s Money can be earned and spent both online AND in-store. If you don’t already know about Plenti points, get ready to freak out in the best way possible. Plenti is as easy as join – earn – save. Once you join Plenti (for free), you’re ready to start earning Plenti points on your everyday purchases at Macy’s and other Plenti partners (like AT&T, Exxon, Rite Aid and more!). Just join Plenti, register your card, and then once you reach a balance of at least 200 points, you’ll be able to use Plenti points for Macy’s savings at checkout. For example, 1,000 Plenti points can save you $10 off your Macy’s purchase. Not only is the Macy’s App convenient, it’s a savings machine. First of all, you can take a picture of an item or outfit with your Macy’s app and it will either find it or something similar to it instantly. How cool is that? I also love the Macy’s app because it’s your ultimate in-store shopping buddy, acting as a price-checker and even sending you deal alerts while you shop (if you enable in-store messages and turn on Bluetooth). But if you don’t hear anything else I say about the Macy’s App, hear this: once you get the Macy’s app, you’ll get an extra 25% off your next app order! This offer is only for new app customers, but is SUCH a great opportunity to save money at Macy’s. I remember the first time I shopped at Macy’s on Michigan Avenue in Chicago. I went to their Customer Service center to ask a question and when they discovered I was visiting on vacation, they offered me a coupon for an additional 10% off my purchase for the entire weekend! Of course, I did have to provide out-of-state ID, but what a bonus. I’ve heard of this same promotion being offered in other Macy’s around the country, but of course, participation may vary. This discount is only valid in the specific store and not online. 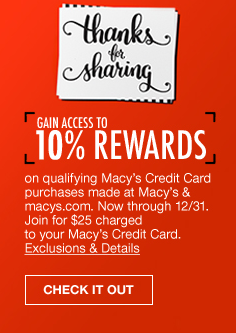 Macy’s Thanks for Sharing is a new Macy’s Cardholder exclusive benefit. Join for just $25 charged to your Macy’s card and earn 10% on qualifying purchases made at Macy’s and Macys.com (through 12/31/17). Your rewards are sent to you on a Thanks For Sharing rewards card, which can be spent on almost anything at Macy’s once it arrives in February 2018. The beautiful thing about Macy’s Thanks for Sharing is $10 out of each $25 enrollment fee will be donated to select charities, up to $15 million! Have you heard? Macy’s Star Rewards benefits have been completely revamped thanks to all of our feedback. Now it’s even easier to earn Macy’s rewards, like free shipping every day for Gold and Platinum members, 5% rewards back on all purchases for Platinum members and ALL Macy’s Star Rewards members get to choose a personal day to save 25% off. Read all the details of the new Macy’s Star Rewards benefits. 9. 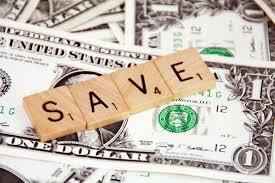 Buy Online, Pick Up in Store, Save More! The savings don’t get much simpler than this: shop online at Macys.com like you normally would, but look for items marked “Pick-Up In Store”. At checkout, you can even split your order up to have some shipped directly to you while you pick others up at your local store (sometimes even on the same day). After you pick-up your item in store, you’ll receive an email explaining how to take up to 20% off your next purchase. It’s just that easy. Did you ever imagine before today that you could save 25% off at Macy’s without a sale going on? Or save on top of a Macy’s sale? Hopefully now you feel better equipped now that you know these eight ways to save money at Macy’s.